India and Australia are the first two sides to make it to the final four of the 2018 Women’s WT20 and both did with hat-trick wins in Group B. This left the remaining games in their group without any context but there is a lot at stake in the tournament’s perspective for both the sides. This game will serve as a perfect warm-up for India ahead of their first WWT20 semi-final since 2010. 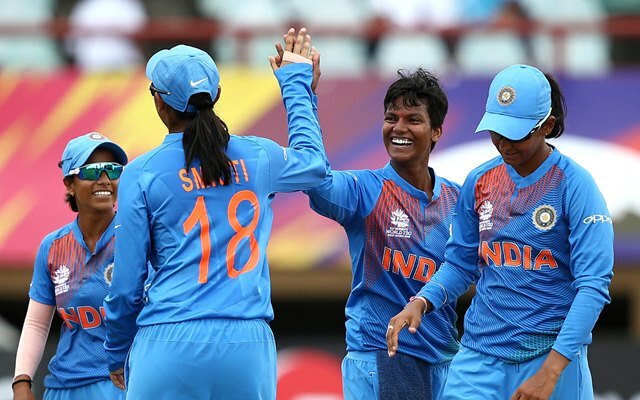 The game result will also give a hint of what can be expected from the Indian Women in the knockouts. India has taken some tough decisions in the tournament so far as they started by pushing Mithali Raj down the order to use firepower early on. This did work against New Zealand but Mithali returned back to opening in next two games. Skipper Harmanpreet Kaur’s post-match quotes suggest India could go back to their initial plans as they felt they were too defensive in their batting. Both the teams have not picked their experienced left-arm spinners Ekta Bisht and Jess Jonassen who might get a look in this game. The 17th match of the Women’s World T20 will be played between India and Australia at the Providence Stadium in Guyana. The match starts at 11:00 AM local time (3:00 PM GMT) (8:30 PM IST). Australia: W, W, W, W, W.
The game between India and Australia will be played on a used pitch. Going by the trend of the tournament, the track could be on the slower side. Since the match is played in the morning, there will be dampness and ball might come on to the bat as the game progress. Teams would prefer to chase on this track under the bright sun. Harmanpreet Kaur (c), Smriti Mandhana, Mithali Raj, Jemimah Rodrigues, Veda Krishnamurthy, Deepti Sharma, Taniya Bhatia, Poonam Yadav, Radha Yadav, Anuja Patil, Ekta Bisht, Dayalan Hemalatha, Mansi Joshi, Arundhati Reddy, Devika Vaidya. Meg Lanning (C), Rachael Haynes, Nicole Bolton, Ashleigh Gardner, Alyssa Healy, Delissa Kimmince, Sophie Molineux, Beth Mooney, Ellyse Perry, Megan Schutt, Elyse Villani, Tayla Vlaeminck, Georgia Wareham, Nicola Carey, Jess Jonassen. Harmanpreet Kaur (C), Smriti Mandhana, Mithali Raj, Dayalan Hemalatha/Anuja Patil, Jemimah Rodrigues, Veda Krishnamurthy, Taniya Bhatia, Deepti Sharma, Poonam Yadav, Radha Yadav, Arundhati Reddy. Meg Lanning (C), Beth Mooney, Alyssa Healy, Ashleigh Gardner, Elyse Villani, Rachael Haynes, Ellyse Perry, Delissa Kimmince, Sophie Molineux, Megan Schutt, Georgia Wareham/Jess Jonassen. Jemimah Rodrigues and Poonam Yadav can be match-turning players for India. Megan Schutt and Ashleigh Gardner hold a similar role in the Australian line-up. Gardner is yet to have a fixed position in the Australian batting order thus far. Her best comes out when she bats at No.3. Alyssa Healy, Harmanpreet Kaur, Smriti Mandhana, Jemimah Rodrigues, Meg Lanning, Sophie Molineux, Deepti Sharma, Georgia Wareham, Poonam Yadav, Delissa Kimmince, Megan Schutt. In current form, it is tough to look beyond Alyssa Healy for a multiplier option. The Australian keeper scored 40+ in the three matches of this tournament. Harmanpreet Kaur’s bowling makes her an ideal option for captain or vice-captain as it gives a security if the Indian captain fails with the bat. Smriti Mandhana brings her best whenever she faces Australia. She can be considered as vice-captain. India might bring in their senior players Anuja Patil and Ekta Bisht for this big game. Dayalan Hemalatha hasn’t done anything specialafter her debut game while another all-rounder Deepti Sharma picked crucial wickets in the previous game after going wicketless in the first two matches. Australia might consider roping in Jonassen for one of Sophie Molineux and Georgia Wareham.